If you are receiving a procedure from the SHAW Center Spa, all treatments will be performed within our office. For more invasive procedures, there are several options for surgical facilities. 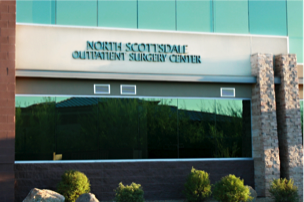 The North Scottsdale Outpatient Surgery Center is a modern, state-of-the-art facility conveniently located on the first floor of our building, offering a comfortable private outpatient surgery option. The Piper Outpatient Surgery supplies a personalized high quality care for patients undergoing a surgical procedure. Dr Shaw is also on the staff of Good Samaritan Hospital and St. Joseph’s Hospital with full admitting and outpatient surgical privileges. The North Scottsdale Outpatient Surgery Center’s highly trained staff will work with you before, during and after surgery to help you feel as comfortable as possible. The facility is a fully AAAASF-accredited Ambulatory Surgical Facility, meaning that it is frequently inspected and evaluated to be accredited by the program. The AAAASF preserves the highest standard of excellence for the facilities it certifies and regularly updates its requirements for safety and quality of care. The operating suite within the North Scottsdale Outpatient Surgery Center is fully prepared, providing general anesthesia and innovative instruments and monitoring devices for patient safety throughout surgery and recovery. Board-certified anesthesiologists perform all procedures that involve anesthesia and all staff members are certified in Advanced Cardiac Life Support (ACLS). The Piper Outpatient Surgery Center supplies tailored, high caliber care for patients enduring a surgical procedure. This surgery center is located on the Shea Campus of Scottsdale Healthcare. Patients experience comprehensive nursing care from the moment they are admitted until they are properly discharged. On top of that, Piper provides a remarkable quiet nursing care unit that creates a relaxed, therapeutic environment for patients that need to extend their stay for 1 to 2 days. This unit also enables one adult family member to stay overnight with the patient.